Corsair announced it's now shipping the Force Series GT line of solid state disks, these models use the SandForce SF-2280 SSD processor with SATA 6Gbps support. The Force GT SSDs promise up to 85K Random Write IOPS, read speeds of up to 555 MB/s, and write speeds of up to 525 MB/s. They will be available in July at $149 for the 60GB model and $279 for the 120GB version. The new Force Series GT is designed for enthusiasts who demand the fastest performance available. It uses the new SandForce SF-2280 SSD Processor, with native support for SATA 6Gb/s (SATA 3), combined with ONFI synchronous flash memory. Force Series GT SSDs deliver outstanding read/write performance and significantly faster system response, boot times, and application load times than SATA 2 solid-state drives, with out-of-box performance of up to 85K Random Write IOPS, read speeds of up to 555 MB/s, and write speeds of up to 525 MB/s. The use of synchronous flash memory makes the Force GT Series particularly adept at reading and writing non-compressible data, such as video and music files. All Force Series GT models are also backward compatible with SATA 2, and include an easy-to-use 3.5" adapter for use in both notebook and desktop PCs. Force Series GT SSDs are currently shipping to Corsair's network of authorized distributors and retailers worldwide and will be available in July at a US suggested retail price of $149 USD for the 60GB model and $279 USD for the 120GB model. Note that stated capacities are unformatted and actual capacities will vary depending on the formatting and operating system used. 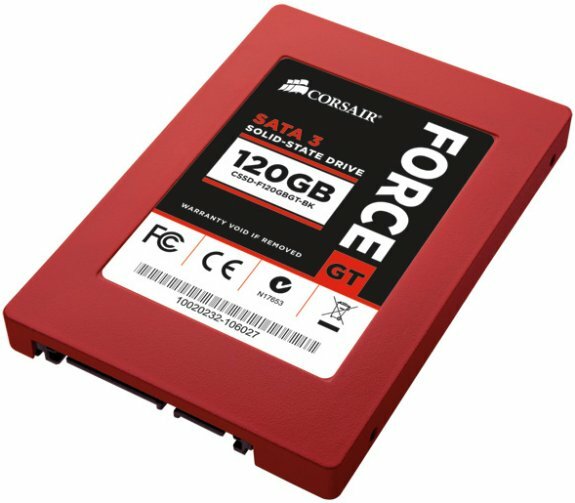 For more information on Force Series GT solid-state drives, please visit the Corsair web site.